Записывайте видео с экрана быстро и без лагов! 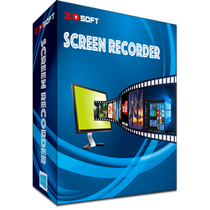 ZD Soft Screen Recorder 11.1.10 был доступен бесплатно 4 июля 2018 г.
ZD Soft Screen Recorder - программа для записи видео с экрана компьютера. Можно записывать как обычные действия за компьютером так и просматриваемое видео и игры. Запись можно вести в полном экране, отдельном окне или выбрать только нужную вам область. Более того программа легко сжимает полученные записи в HD видео файлы. NB: Информация для регистрации находится в Readme файле. Добрый день! У меня не выходит окно регистрации программы. Что делать? выбери записать видео. в трее справа покажутся инструменты для записи. нажми там на иконку папки, откроется окно. будет написано REGISTRATION там и введи регу. Наталья Станиславовна Вышар, выбери записать видео. в трее справа покажутся инструменты для записи. нажми там на иконку папки, откроется окно. будет написано REGISTRATION там и введи регу. Прога установилась, зарегистрировалась, функционирует, однако, нет того красивого интерфейса, что здесь на скринах. Куда он пропал? Затем, в режиме рисования, расстановка цифр происходит от 1 до 9. А где же 0? Конечно, эта функция не так важна, но "0" в этой функции самый главный! Прога установилась, зарегистрировалась, функционирует, однако, нет того красивого интерфейса, что здесь на скринах. Куда он пропал? Затем, в режиме рисования, расстановка цифр происходит от 1 до 9. А где же 0? Конечно, эта функция не так важна, но "0" в этой функции самый главный! Чтобы скачать русик надо пароль вводить. Alex, Хороший сайт, блин. Чтобы скачать русик надо пароль вводить. Kosta, пароль внизу написан, вводишь в обе строки- rsload.net На будущее, что бы знать. Все активируется без проблем, быстро и четко. В текстовом файле не только ключ для активации, но и почта, которую надо ввести в поле регистрации. Внимательней читайте правила установки программы ! Только вот смены языков я что-то не нашел, все на английском. Все активируется без проблем, быстро и четко. В текстовом файле не только ключ для активации, но и почта, которую надо ввести в поле регистрации. Внимательней читайте правила установки программы ! Только вот смены языков я что-то не нашел, все на английском. Станислав, NB: Информация для регистрации находится в Readme файле. 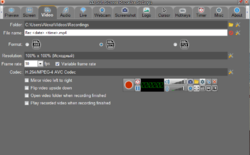 ZD Soft Screen Recorder was not a keeper for me. Here is what happened upon install. 1. 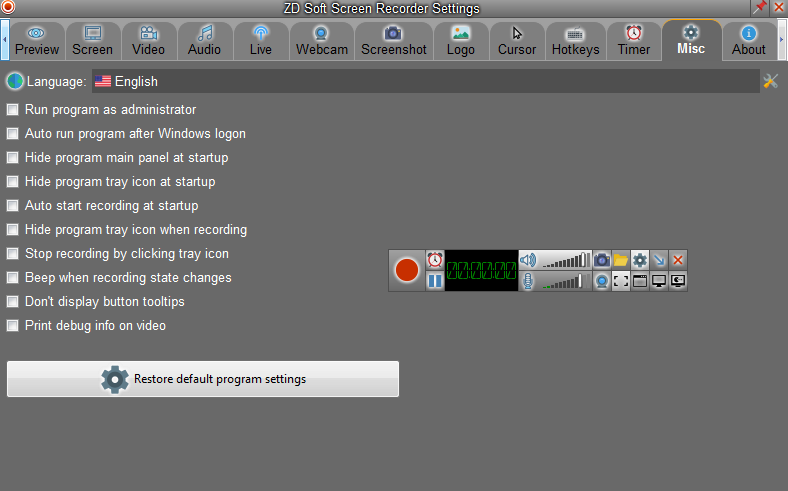 The program installed fine but I had trouble with getting it to record the screen. 2. 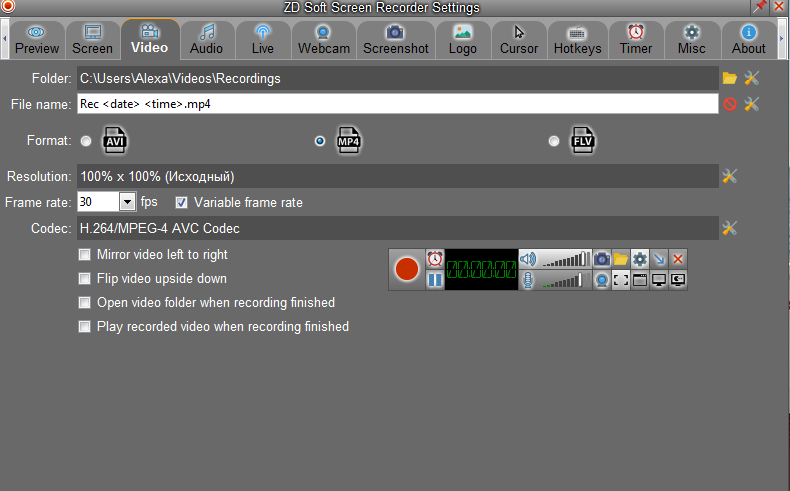 Upon recording the screen, the video of the screen recording would not play in my player, Windows Media Player. 3. The computer froze and I had to do a hard reboot. 4. Upon reboot my Internet connection would not connect for 4 to 5 minutes. 5. Once I finally connected, I uninstalled the program and found out it was coded by Shenzen Software - a Chinese Company. This is not a keep for me, I hope you have better luck. All updates up to date. 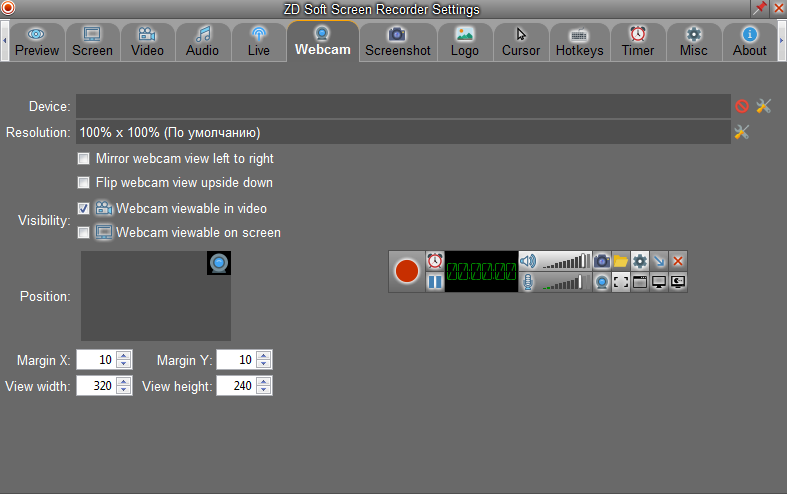 ZD Soft Screen Recorder was not a keeper for me. Here is what happened upon install. 1. The program installed fine but I had trouble with getting it to record the screen. 2. 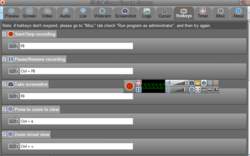 Upon recording the screen, the video of the screen recording would not play in my player, Windows Media Player. 3. The computer froze and I had to do a hard reboot. 4. Upon reboot my Internet connection would not connect for 4 to 5 minutes. 5. Once I finally connected, I uninstalled the program and found out it was coded by Shenzen Software - a Chinese Company. This is not a keep for me, I hope you have better luck. Win 7 Ultimate. All updates up to date. It had an intuitive interface - I loaded my game, selected game mode and it automatically found the exact edges around my game and recorded just that. This is not a feature I've seen before. It has a variety of drawing tools that you can write on your recording as you go along - I tried that and works well, it's very cute actually - it shows a small pen drawing on the screen. There are a lot of customisable options. It stays in the corner of the screen and does not minimise to the task bar - so it remains accessible. It has a screenshot mode that is really good for games - you can just click on the little camera as and when you want a screenshot and it automatically takes the screenshot and saves it as graphics files - you choose - .png / .jpg etc. When you're done the files are all there for you. Installed / Registered without a problem. 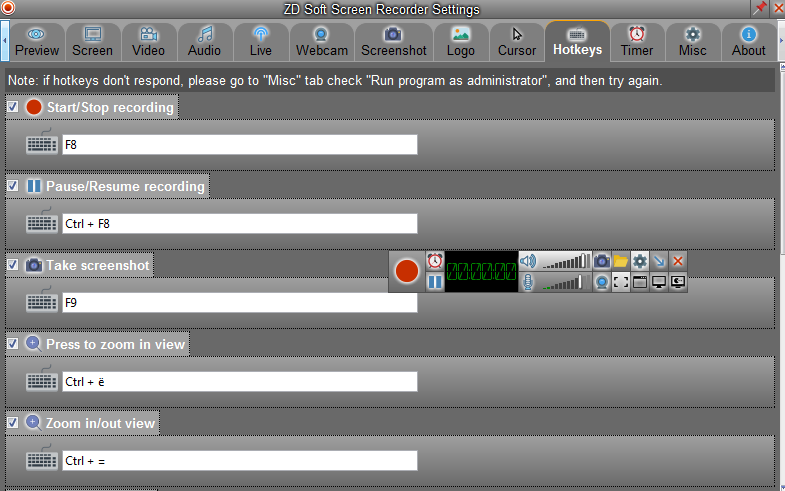 (Click an option to record something then it takes you to the interface, from there you can register - or record something then there's a pop-up.) Tested it on a game and was happy with the quality - as good as any other recording software I've used. The sound was perfectly in sync - and even more it captured the audio even when it was turned off (The PC was playing the audio, the speaker to play it to me was off.) What makes this one better: It had an intuitive interface - I loaded my game, selected game mode and it automatically found the exact edges around my game and recorded just that. This is not a feature I've seen before. It has a variety of drawing tools that you can write on your recording as you go along - I tried that and works well, it's very cute actually - it shows a small pen drawing on the screen. There are a lot of customisable options. 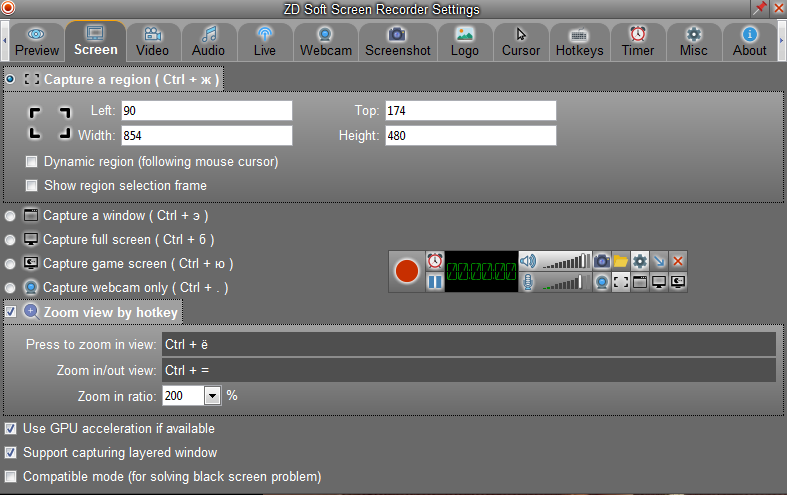 It stays in the corner of the screen and does not minimise to the task bar - so it remains accessible. It has a screenshot mode that is really good for games - you can just click on the little camera as and when you want a screenshot and it automatically takes the screenshot and saves it as graphics files - you choose - .png / .jpg etc. When you're done the files are all there for you. I'm impressed. There is no activation code only the the giveaway@giveawayoftheday.com for registration in the readme file. Exactly how do we obtain the activation code ? There is no activation code only the the giveaway@giveawayoftheday.com for registration in the readme file. Exactly how do we obtain the activation code ? Ken, don't overthink this. Use your own name in the "Name field." In the "email field" use email@giveawayoftheday.com and in the "activation code" box use whatever activation code was in the read me file that you downloaded. It should be in the same folder as your .exe file. I have used this program for a couple of years now and it does a great job. It sits in the lower corner of the screen and you wouldn't even know it is there recording whatever is running on the screen. I have never had a problem with this program and I would recommend it. I have used this program for a couple of years now and it does a great job. It sits in the lower corner of the screen and you wouldn't even know it is there recording whatever is running on the screen. I have never had a problem with this program and I would recommend it. Tested it with a vid on line (and a vid off line). Easy to "size" to capture the area you want. Recorded sound and visual successfully.